The C.A.M.S. concept starts with a Newage microhardness tester (or competitive microhardness tester), such as our MT91 Series or MS-ZH Series with video camera, combined with our software, personal computer and any required accessories, such as a motorized X-Y-Z axis positioning table. The C.A.M.S. software complements the advanced video capabilities of the system by providing comprehensive test setup tools, including intelligent prompts and menus that guide the user through the test configuration process- from basic microhardness testing to sophisticated case depth profiling. Test configuration is intuitive and information is presented in a logical, step-by-step sequence. A variety of testing attributes are presented for your testing. Configuration is as simple as selecting options from a list. There is minimal text entry. Once the test setup is configured, the C.A.M.S. solution provides the user with a variety of on-screen navigation tools. For example, on-screen navigation with motorized positioning lets you select from four ways to direct movement of the test sample using an X-Y table. Navigation can use the computer mouse or a virtual joystick controlled from the computer display. Directional arrows on the display allow you to jog the position of the sample by 1µ (0.001mm) increments- ideal for stepping through traverse positions. Operators can be prompted during the test to enter specific information about the current test process. When the automatic measurement function is used, operator influence is eliminated. C.A.M.S on-screen analysis is exceptional. A comprehensive display shows your hardness results, converted values and tolerances at a glance. 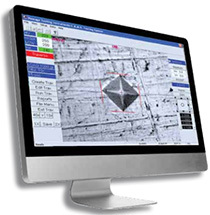 You can measure total case depth in standard or full screen viewing mode or perform detailed image analysis such as grain sizing or crack length. Operators can even orient the traverse direction to each test part, on the screen, and within seconds. Viewing the impression and positive positioning of the filars from the displayed image is much easier and faster than having to use an eye piece. Lastly, C.A.M.S. supplies comprehensive data management tools and report generation capabilities. A variety of standard report formats are provided. Operators can capture images of the impression, plot overlays or multiple case curves for comparison, perform statistical calculations and general tabular and graphical reports- quickly and easily. C.A.M.S. can also retrofit with most competitive microhardness testers from ATS®, Buehler®, Clark®, Leco®, Mitutoyo®, Shimadzu® or Wilson®. Seeing is believing. Exceptional user-friendliness without compromising accuracy or testing sophistication. Get the right system for your application and your budget. Protect your initial investment- add functionality as your needs grow. Immediate return on your investment. A unique interplay of automatic and manual control so users can override functions for select operations such as focusing. Maintain your current microhardness tester while adding the C.A.M.S. software benefits.